Oh hey there. I bet you're surprised to see me. You're not alone... cuz I'm here! jfdapkljkldfklanvmkldsa;j yuck that was a horrible idea. Not tasty at all. And when's the last time I washed my keyboard???? But enough about me, let's get on with the post. One of the things I'm trying to make into a daily habit/routine is getting a little more walking into my daily routine/habit. Circle of life, deal with it. So on those days when I don't bring lunch to work with me and when I remember to take a lunch break (also a routine I should work on), I pop down to either the cafeteria or Subway to grab a sammich or wrap. Lately I've been taking the stairs (gasp). That gasp was me being all out of breath from taking the stairs, not being surprised that I was actually taking the stairs. I like going down the stairs a whole lot more than climbing up, although they both kinda burn the booty. We all need an Area of Refuge. 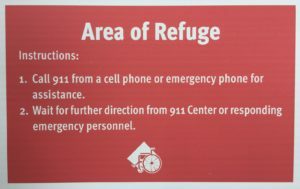 Not a place in the stairwell from which we can call for assistance (unless you're into that), but a place where we can attain the Oxford definition of refuge. I have some worries about money and about missing family and about missing that deadline at work, but I almost never don't feel safe. (It's my site and I'll use whatever horrible grammar I want). My life is pretty much an area of refuge. I read stories every day about people and animals who are abused or neglected or left without the basics of life... you know, food, shelter, love, puppies... and I can't imagine how it must be to not have a place to go where you are safe from pursuit, danger or trouble. I know "without" is a way of life for so many, and I'm humbled by and thankful for the reminders of just how much I have. There are those who don't know where their next meal is coming from (mine is coming from HopJacks, thank you very much), or where they're going to sleep tonight (I'll be tucked into my queen size bed with the white noise machine on), or even if they're going to wake up in the morning (ok so nobody really knows that one, but I know there will be coffee waiting). I'm lucky enough to fairly consistently feel safe and sheltered, and to have food, shelter, love and yes, puppies. But even I have times when I feel like I need refuge, when I could use a place to go where I feel safe from the world of demands and attention and traffic and deadlines and where I can just be... Dee. A place of refuge where I don't have to worry about what people think or how much money I owe or make. A place where I believe I'm funny and handsome and worthy in spite of my white legs and where, even when the world treats me like a 4, I'm a 10. I'm a lucky guy, cuz I have that place. And I'm lucky that I can come here and share all of that with you. This is, and you are, the place where I feel most safe. You are my area of refuge. So tell me, dear reader(s)... where is your Area of Refuge? Where do you feel safe?